The stunning gold edition of the Samsung Galaxy S7 is expertly crafted from glass and metal and introduces the first ever dual 12 mega pixel camera. 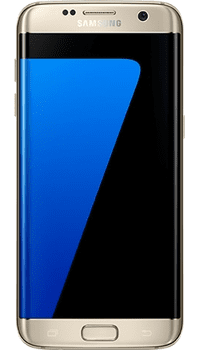 Boasting a 5.5 inch Super AMOLED Quad-HD curved display the S7 Edge adds in dedicated notifications to its screen edge for quick access as well as new ‘Always On’ display functionality. Inside there is powerful octa-core processing and 4GB of RAM along with the latest Android operating system plus a 32GB of memory expandable up to a whopping 200GB with MicroSD cards. Keeping everything running is a large 3600mAh battery that can be fast charged to capacity in just 150 minutes and also allows for wireless charging convenience. Use our advanced filters to slice through the hundreds of offers for the Samsung S7 Edge Gold, choose a different network than your current one to ‘port’ your number across and take advantage of ‘new customer’ deals or select upgrade deals with your existing provider to compare the cheapest upgrade prices for you gold S7 edge. Although it is tempting to not pay anything upfront for your new phone, always check out the lower priced tariffs with an upfront cost, most of the time you’ll find paying a little upfront will save you lots over the minimum term of your contract period. Then, you can head back to our website to compare the cheapest Galaxy S7 Edge Gold upgrade deals on your network from all of the retailers. Choose from the best contract offers for your new Samsung Galaxy S7 Edge Gold on a different network and save a bundle!